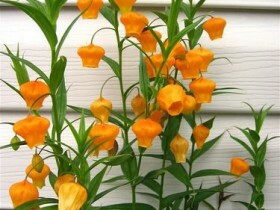 In the photo: flowers sandersonii really resemble Chinese lanterns. 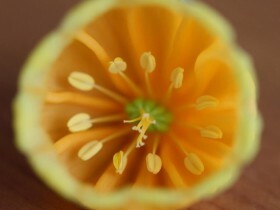 Flowers-lanterns – it's not just everyone knows the physalis. 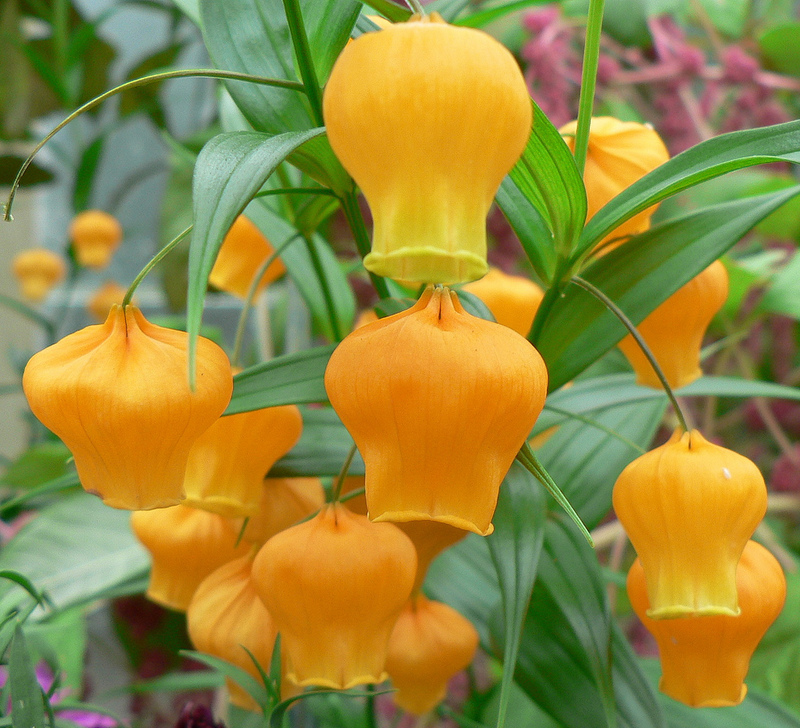 With the unusual fruit of this shrub will be pulled klubniy exotic – sandersonia or the Golden Lily of the valley, other names – "Golden bell", "Chinese lantern". Light orange flowers are ready to soar above the garden. Discovernet plant stresses and unusual foliage. Garden beauty difficult in the cultivation, it does not tolerate frost, in order to achieve results – will have to work hard and experienced gardener. In the genus sandersonia there's only one plant – Orangeville. In the wild African Liana almost never occurs. Develop a culture of tubers forked shape with two kidneys. They grow into stalks and leaves, after completion of the period of vegetation formed daughter tubers and the "kids" at the base of the shoots. The development of "offspring" can have a negative impact on the flowering, they take the child individuals a lot of effort. 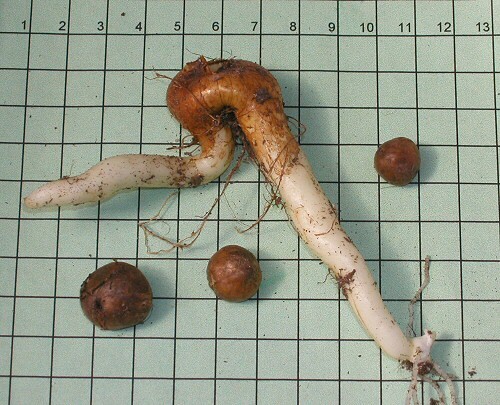 The tubers are brittle, careless digging soil could be detrimental sandersonii. The stem of the plant is a powerful and high, plastic and flexible, as befits the vine. Antennae, located at the ends of the leaves, adapted for clinging to support. 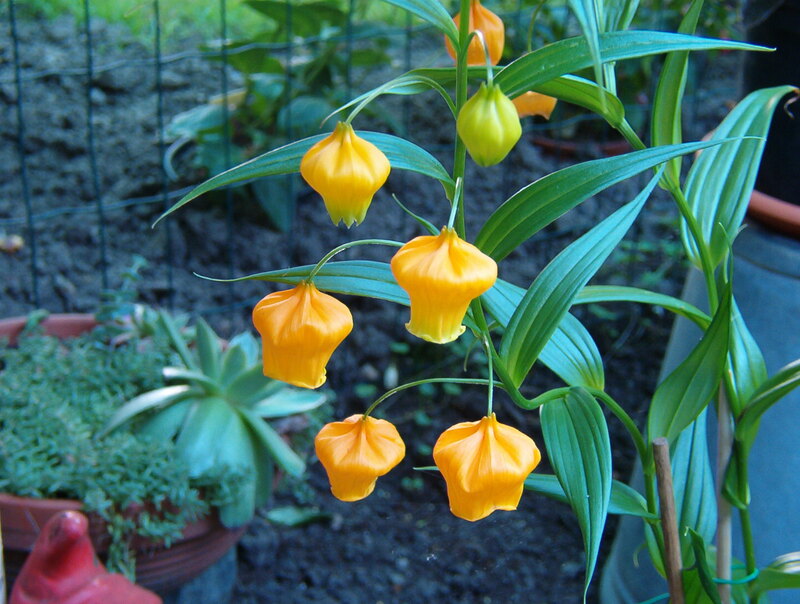 Lanceolate leaves are arranged symmetrically, their color blends perfectly with orange bells. After four or five months of intense growth, the culture enters a dormant stage. Even there, where there is no frost, sandersonia flows into "hibernation", remaining in the soil. For seven or eight months she's not showing any signs of growth. In winter, the plant dig. 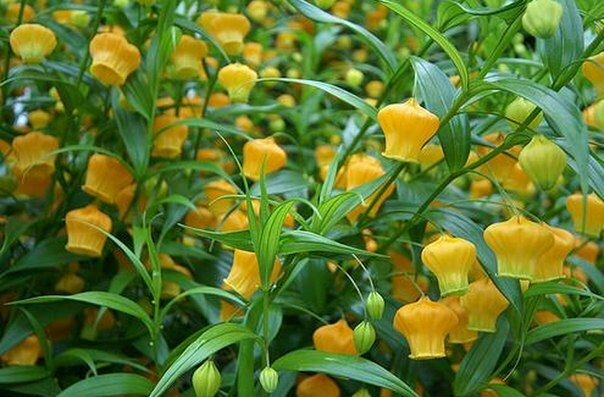 If Golden bell is growing in a comfortable environment, its flowering pleases the profusion. beautiful pot plant or srezochnyh culture. Sandersonii bushes in the garden. The classic way of care – plant cultivation, as a perennial with digging for winter. Agricultural practices similar to the breeding of dahlias, noble gladioli, other bulbotuberiferous and onion, but sandersonia safer not just store in a cool place, but to plant in pots. Another, the lightweight strategy is to abandon the Golden Lily of the valley planting in open ground, and enjoy planting in containers. In this case, the roots for the winter don't dig, just cut the aboveground part and carry the flower in a dark room, watering is minimal. In February sandersonia Wake up, it is grown until the onset of warm time in the living room, and then take out in the garden or on the terrace. Wintering is possible in frost-free greenhouse or Conservatory. Place the exotic Sunny location, it is necessary to pay attention to the protection from drafts and strong winds. Under these conditions of temperature inadequacies. The soil must be loose, fertile, neutral or slightly acidic, with good air- and permeability. It is necessary to provide effective drainage. Too short and cool summer can cause weak flowering, if this has not happened, then every year the player better adapt to atypical conditions, becomes less sensitive to the cold. Sandersonia – the plant is poisonous. When it is desired protective gloves and the observance of other precautions. Culture planted in containers or pots in late winter. To encourage the spilling of the kidneys are artificially: sandersonii treated with fungicide solution, soaked in warm water and kept at a temperature of from 25 degree prior to the beginning of germination of kidney. The next stage: planting plants in containers, the procedure is performed at the end of February. Sandersonia watered, contain in the light and in the warmth, but do not feed. Vines were grown until, until stable and warm weather. At observance of all these conditions it is possible to obtain a stable, profusely flowering specimens. In may the plant is transferred to the open ground, improve it by making organic fertilizer, sawdust, peat, bark. Supplements will help make the soil friable. To ensure the absence of disease, the soil was sterilized with methyl bromide or chloropicrin. Distance between plants – 30 cm, planting depth 5 cm. Separated material is set to such a depth, to slice hovers above the soil line. In the photo: root sandersonii. Treatments irrigation – moderate, as needed. Unacceptable waterlogging or drying out. Sandersonia – Liana, she needs support mandatory. The plant will not waive timely feedings. The main fertilizers are made before planting, to improve the soil organic matter is used. If the soil is poor the plant is watered once a month water with dissolved fertilizers, before and during flowering. Before the arrival of the first autumn frosts culture cut, removing all aerial parts. Tubers with a big lump of ground dug, the ground shake, and the roots are soaked in a solution of any anti-infective funds 10 minutes. Hemp treated with powdered charcoal or other special means for seeding of wounds and prevent infection with fungal diseases. The tubers are dried for several days in a warm and dark place outdoors. Prepared korneklubni placed in pots or boxes of peat or loose soil. 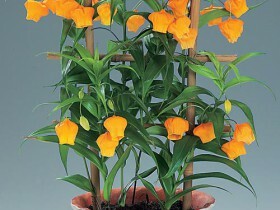 Containers with sandersonia put in a room with a low positive temperature three to five degrees and total darkness. The vine can be stored in the refrigerator: she will spend the winter in paper or plastic bags with holes, buried in soil or peat. Temperature regime should correspond to the same values, as above, it is best to put culture on the bottom shelf, the warmest. The minimum duration of this "wintering" – 12 weeks. 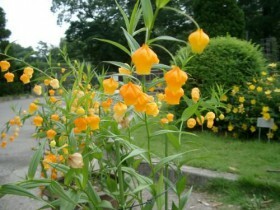 In the photo: Golden sandersonia in the garden. Method one – Liana-beauty propagated by division of tubers. For this purpose, large and Mature planting material. Two full share points of growth annually, the procedure is performed after cold storage, before planting. Tools should be sharp and clean, slices treated with charcoal. The tubers are dried and soaked in a solution of fungicide. As undivided sandersonii, separated specimens soaked in water the same temperature, keep warm, during the week, until germination. Planting depth: 5 – 10 cm. The cut must remain on the surface of the soil. Planting seeds is in early spring. After collecting the material should be in the dark, dry and cold. Hatch seeds for a long time, two years the young vines should grow at room temperature. After reaching a six-inch height they dive in a separate container. The method is rarely used. Sandersonia – not the most resistant plant. In the garden, beauty can catch the caterpillars and slugs, spider mites, rot and Fusarium. The main methods of struggle – soaking of tubers in the respective solutions, examinations throughout the summer. Do not let the excess moisture and the roots zamokaniye. A Golden Lily on a pedestal. Sandersonia in the garden landscape. 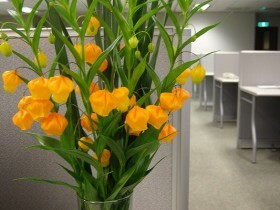 Golden Lily of the valley near the wall. All content on this site SamDizajner.ru written specifically for Simdesigner, copying 1 in 1 strictly prohibited. 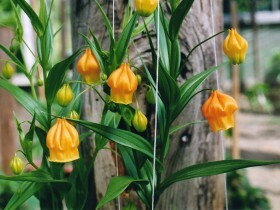 Reprint, full or partial rewriting of the article “The Golden Lily or sandersonia”, possible, only when you specify the full, active link to the source.